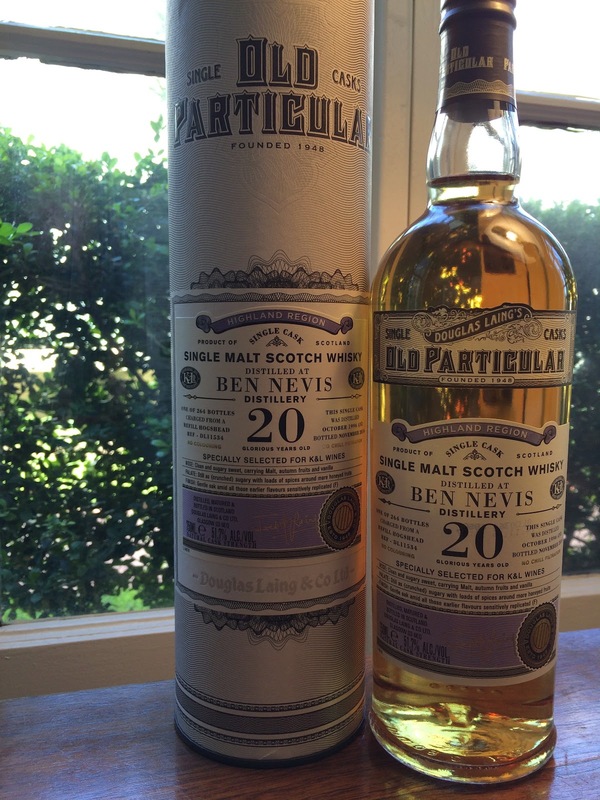 Old Particular Ben Nevis 20yo (57.1%): I don't want to take too much of your time here by telling the story of the distillery the second time but if you want to take a look at it you can simply click on "Dew of Ben Nevis Special Reserve" link from back in 2015. I have the whole story covered there. Anyway Ben Nevis has been always an interest of mine and when I received the email from K&L a few weeks ago I knew that I couldn't let this single cask bottling offer slip by. And the bottle is sitting in front of me on my desk as you can see. It is a refill hogshead bottled by Douglas Laing under their Old Particular label exclusively for K&L Wine Merchants. The whisky is distilled in 1996 and bottled in 2016. The cask yielded 264 bottles. Color: Incredibly light in color for a twenty year old whisky. Very promising... Yellow gold, oaked Chardonnay. Palate: Hot and very compressed and mute at full strength. Crystal candy, honey and green wood. Water is needed right away... Now way less sweet, more spicy and surprisingly green and vegetal. White pepper, pine cones, fresh rosemary and fresh thyme leaves. Sea salt, bitter greens and endives. Dry clay soil and chalk. Finish: Long and hot. White pepper, lightly toasted oak and churros with an odd dry bitterness at the very end. Overall: I'll be very straightforward here: The nose raised the bar so high I simply thought that I hit the jackpot for a few minutes but unfortunately I wasn't that lucky... Am I disappointed after I tasted it? Well, maybe a tiny bit. And just because it felt like watching the ball rebounding onto the field from the foul pole after a perfectly executed home run hit... At the end of the day it is a perfectly good whisky with an amazingly decent price tag attached to it. No doubt about that... I will enjoy every drop of it while making sure that I nose it very very long every time before I take a sip.